One of the most common questions asked by our enterprise customers is “Who needs IPv6?” Since IPv6 does not add any significant new functionality (apart from larger address space), you can’t gain much by deploying it in an enterprise network … unless you’re huge enough that the private IPv4 address space (RFC 1918) becomes too confining for you. A good case study is Halliburton; you’ll find the details in Global IPv6 Strategies: From Business Analysis to Operational Planning book (my review). 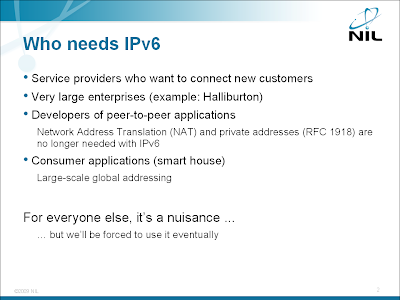 The need for IPv6 deployment is one of the topics discussed in the Enterprise IPv6 Deployment workshop. You can attend an online version of the workshop or we can organize a dedicated event for your team. Consumer applications (like smart house) that would like to use globally-valid addresses. For example, Arch Rock is one of the companies making IPv6-based wireless sensor networks (a Google search for “IPv6 sensors” will also give you numerous sources). For everyone else, IPv6 is something that you don’t want to be involved in (apart from the new toys perspective), but you’ll be forced to deploy it sooner or later. IPv6 is mandid for the ISP but I don't think so MPLS SP need to migrate on IPv6. At the moment, MPLS core cannot be moved to IPv6 as LDPv6 (LDP for IPv6) is not available. However, Cisco solutions 6PE & 6VPE can do a pretty good job if IPv6 is to be used between PE & CE. I think the concept of Internet of things will use IPv6 intensively. Good explanation, but I still think some pieces are missing, that I tried to bring forward in my reflection "what ISP needs to do for his customer (IPv6 wise)"
Dual-stack PPP requires two separate sessions? IPv6 in the Data Center: is Cisco ready? ITU: Grabbing a piece of the IPv6 pie?